Astronaut Thomas Pesquet took this photo of Dublin, Ireland from the International Space Station on Jan. 24, 2017. Happy St. Patrick's Day from the International Space Station (ISS)! NASA astronaut and ISS Cmdr. Shane Kimbrough beamed his St. Patrick's Day greetings to Earth this morning and tweeted a photo of Ireland taken from space. 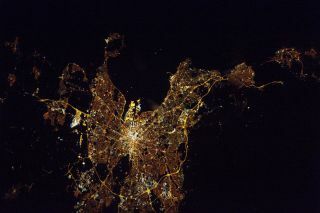 Viewed from overhead, Dublin's city lights resemble the shape of a butterfly or a moth. That bright, glowing road that wraps around the city is the M50, the busiest motorway in Ireland. Pesquet is not the first astronaut to tweet photos of Ireland from space for St. Patrick's Day. In 2015, NASA astronaut Terry Virts shared two photos of the island in its entirety. But there are plenty of ways to celebrate St. Patrick's Day at the space station other than taking pictures of Ireland. In 2011, Irish-American astronaut Cady Coleman marked the day by playing a 100 year-old Irish flute in space. And in 2013, Canadian astronaut and musician Chris Hadfield dressed up with a snazzy green sweater and bowtie and recorded his own version of "Danny Boy," a traditional Irish song.